In the Netherlands, for coastal and inland water applications, wave modelling with SWAN has become a main ingredient. However, computational times are relatively high. Therefore we investigated the parallel efficiency of the current MPI and OpenMP versions of SWAN. The MPI version is not that efficient as the OpenMP version within a single node. 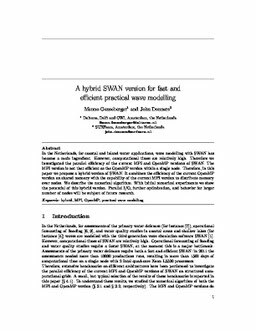 Therefore, in this paper we propose a hybrid version of SWAN. It combines the efficiency of the current OpenMP version on shared memory with the capability of the current MPI version to distribute memory over nodes. We describe the numerical algorithm. With initial numerical experiments we show the potential of this hybrid version. Parallel I/O, further optimization, and behavior for larger number of nodes will be subject of future research. Genseberger, M, & Donners, J. (2015). A hybrid SWAN version for fast and efficient practical wave modelling. Multiscale Dynamics [MD]. CWI.